Dentures are full-mouth false teeth, which are used when a patient has no teeth left on either the mandibular arch, the maxillary arch, or both. Patients can become entirely edentulous (without teeth) either due to ineffective oral hygiene or trauma. Removable complete dentures can help give the edentulous patient better masticatory (chewing) abilities, as well as enhance the esthetic appeal of their lips in specific and their entire face in general. A denture is a removable replacement for missing teeth and adjacent tissues. It is made of acrylic resin, sometimes in combination with various metals. Complete dentures replace all the teeth in a jaw and fit directly on the gums and supporting bone. Complete dentures can also be made to attach to dental implants. Partial dentures fill in the spaces created by missing teeth, resting partly on the gums and partly on the remaining teeth. Whether some or all of the natural teeth are missing, there are several benefits from replacing them with complete or partial dentures. Replacing missing teeth helps to fill out the smile by giving support to the cheeks and lips. Also, a more youthful, vibrant appearance is achieved by supporting facial muscles. Speaking, chewing, swallowing and smiling are also improved. Partial dentures prevent teeth from shifting into the spaces created by the missing teeth. This helps prevent bite problems and decreases the likelihood of gum disease that is often associated with crooked teeth. When a denture is attached to dental implants, especially the lower denture, its retention and stability are dramatically improved. 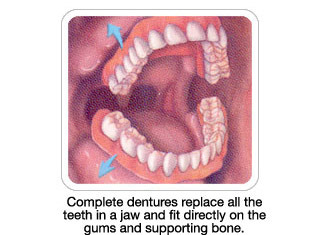 Also, the bone loss that occurs yearly with complete dentures is avoided. 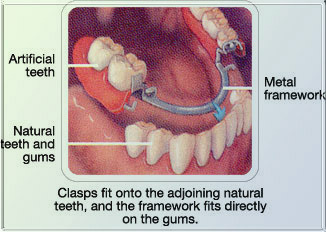 Some possible inconveniences that are associated with a removable appliance such as a partial or complete denture include: the fact that it is not fixed in the mouth and therefore must be removed while sleeping and to clean, some chewing movements may dislodge the denture, and the possibility of developing sore areas where the denture contacts the gums. Depending on how strong and where the remaining teeth are located, an alternative to a partial denture is a fixed bridge or dental implants. Dental implants can also be used as an alternative to complete dentures. Bridges, dentures, and crowns in various combinations can be placed on one to several implants to replace any number of missing teeth. Teeth are often restored with fillings of silver amalgam or composite plastics. These materials can often accomplish the aim of replacing the part of the tooth that has been lost in a strong and good-looking manner. However, there comes a point where the damage to the tooth has removed too much structure to hold a filling or the tooth is cracked. The restoration must be done with the use of a dental crown. This dental restoration technique involves using a tooth-like covering or “cap” that is placed over a carefully prepared existing tooth, to strengthen, restore or improve the appearance of your natural tooth. How are dental crowns used to restore a tooth? Since a dental crown cemented into place essentially becomes the new outer surface of the tooth it is easy to imagine how the placement of a crown can restore a tooth to its original shape. Dental crowns are often made for teeth that have worn excessively, have broken, or else have had large portions destroyed by tooth decay. Conceivably the placement of a dental filling could, as an alternative, be used as a means to restore a tooth’s shape. Dental crowns however offer a big advantage to your dentist over dental fillings by way of the fact that they are fabricated “away from your mouth”. By this we simply mean that dental crowns are fabricated in a dental laboratory (by a dental technician who uses plaster molds your teeth made by your dentist). Dental fillings, in comparison, are created “in your mouth” by way of your dentist placing the filling material directly upon your tooth. When a dental crown is made the dental laboratory technician can visualize and examine all aspects of your bite and jaw movements, from a variety of angles, and sculpt your dental crown so it has the perfect anatomy. In some cases this anatomy will be even more ideal than your tooth’s original shape. When placing a dental filling a dentist has less control over the final outcome of the shape of your tooth because it is often difficult for them to visualize, evaluate, and access to the tooth on which they are working. Can dental crowns improve my cosmetic appearance? Since dental crowns cup over teeth, any dental crown that has a porcelain surface can be used as a way to idealize the cosmetic appearance of a tooth. Possibly you have heard it said (especially in past decades) that such-and-such movie star has had their teeth “capped” (the term “cap” used here is equivalent to the term “dental crown”). This simply means that the person has obtained their “Hollywood smile” by way of having dental crowns placed. Actually, getting your teeth “capped” so just to improve their appearance can at times be a very poor choice. Dental crowns are best utilized as a way to improve the cosmetic appearance of a tooth when the crown simultaneously serves other purposes also, such as restoring a tooth to its original shape (repairing a broken tooth) or strengthening a tooth (covering over a tooth which has an excessively large filling).